For the 14th Meeting of the CIA, we visited Southern Italy to the seaside resort of Sorrento, just south of Naples. This was not an easy place to reach and there are many stories of delays in travel. The best concerns a worker from New Orleans, USA who got as far as Castel Ammare ( 12 miles from Sorrento ) and then the train he was on went on strike and for over 2 hours nothing happened. Finally he reached his hotel about 10 p.m., only to find that food was not served after 9:30 p.m.
After a highly successful "Welcome Cocktail" evening at the Hotel Cocumella (actually in the cellars where the monks used to concoct their brandy), we got down to work on Monday October 11th. The Carl Prausnitz Memorial Lecture was presented by Dr. Metzger on "Taking the receptor for IgE apart and putting it back again". With some well-chosen slides, the idea of four blind Indians trying to keep the elephant quiet appealed to the audience, but it was too much when, for the elephant, the whole zoo was substituted. Nevertheless, most of us appreciated the value of a detergent-lipid mixture to help separate the B-chain from the human IgE receptor. But the statement - "Do not worry, my results are NOT too exciting" - shook most of us. The rest of the morning was set aside to IgE receptors and cell activation, with a suitable coffee break interspersed - the coffee was orange juice and snippets but that didn’t matter. Mesenteric lymph cells can be made to produce A) Suppression and B) Potentiation according to needs. DW2 positive linked to RA5 negative, and vice versa. Truly what a performance by hyphenated immunologists in Naples Bay. 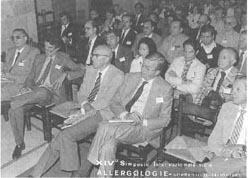 At the "General Assembly" that night, Felix Milgrom ended his term of office as President and Kimmy Ishizaka took over - and we heard that the next meeting was to be somewhere in the USA. Meanwhile on this day the ladies (and three men) had been by coach to Amalfi and Positano for a fine whole-day excursion in pleasant weather. We awoke on Tuesday to the sound of thunder and tropical rain. This did not worry most of us but it delayed the ladies excursion to the Isle of Capri. That morning we heard all about "Lymphocyte and Mast Cell Populations". One superb talk came from Dr. Siraganian from Bethesda, stressing the link between selectivity of arachidonic acid release by antigen and the involvement of PGs. After a working lunch again, we divided for the first of the poster discussions. Most considered it was not a good idea to divide - chiefly because they were not time-scheduled. During one of these sessions, we heard that sometimes the unusual does the trick. For example, a broken-off needle left in the thorax had cured an allergy but the patient finally had to be controlled - in this case, controlled meant the patient died. At 4.30 p.m. we all prepared for the highlight of the social programme - the visit to the isle of Capri by Alascarfo. We all noted that the weather was not too settled and the sea was rough but we did not realise the boat cannot always perform. And so it was. We all reached halfway to Capri - some sicker than others - and then the Captain said "Enough is Enough" and we turned round and returned to Sorrento. What a disappointment! However, the organisers got cracking and a quickly arranged dinner at a restaurant down town was greatly appreciated. Incidentally, the ladies of course were with us on this abortive attempt to reach Capri for the dinner on the island. We are now in the age of FACTORology and soon it will be IgZ. Wednesday afternoon was Pompei time and a most exciting two hours we had at the site of this ancient city. That night, we had the "Social Dinner" and a recital by Peppino Di Capri. This was music, singing, dancing and local customs - all until 1 a.m.
We ended the meeting on Thursday morning with a session on mediators of "Allergic Reactions". Congratulations and thanks go to the organisers - Condorelli, Marone and Rossi - for a highly successful meeting. I understand that some did get to Capri later whereas others visited Herculaneum.